Scotland's new King in waiting, Alex of Salmond, today refuted claims that he is making up policy on the spot. He also denied that he was making a desperate bid to secure his coronation before grown-up Scots sober up and realise life probably isn't all England's fault after all and hastily reverse their plan to allow children to vote. Alex “King” Salmond said that perhaps any confusion had arisen by journalists who might have used Siri and its triumph with regards to understanding the Scots. Mr Salmond then re-launched the revised policy stressing that people had misheard him talking about Scandinavia and he had all along been stressing Scotia communities. Mr Salmond was pressed as to whether or not he thought it important that Scotland's central bank would now be over three thousand miles away in Ottawa but said that this was clearly in line with his policy. 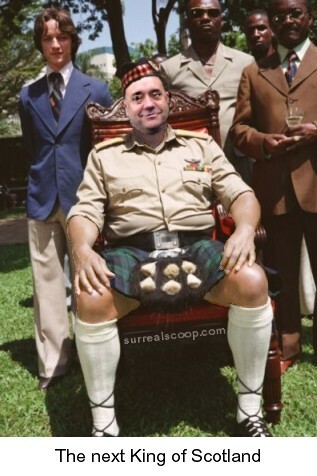 Salmond has a vanity project, the people of Scotland will pay for it with their futures. The idea of letting children vote just sums up the naivity displayed by the "everything is England's fault" crowd.